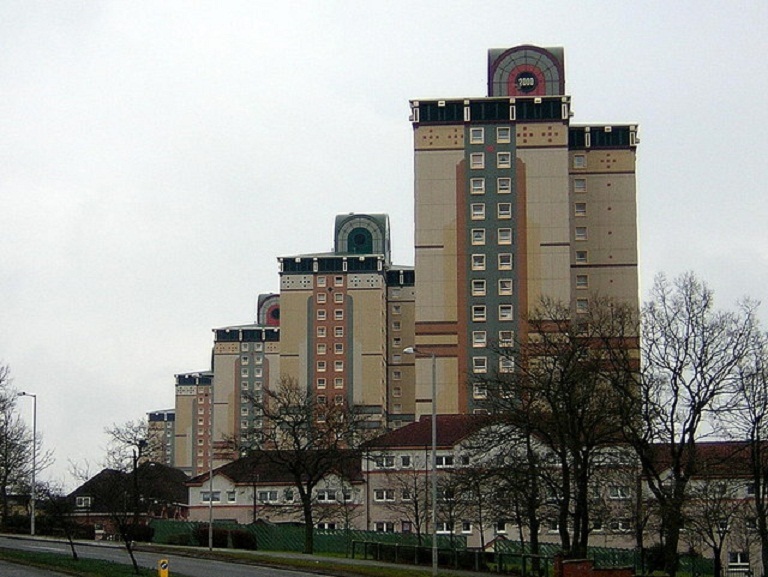 Although our project focuses on Glasgow, high rise flats were built throughout urban Scotland. Overcrowding and insanitary housing conditions continued to be a problem in many Scottish towns following the Second World War, and this was no different in Motherwell. 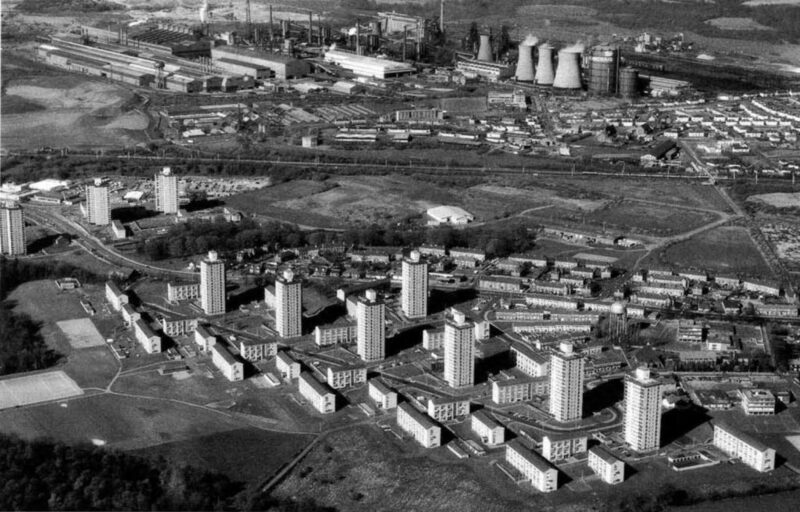 Motherwell, situated to the south east of Glasgow, had a population of 37,000 people at the start of the twentieth century, many of whom worked in the town’s steel industry. Originally the Colville family owned the steel works. 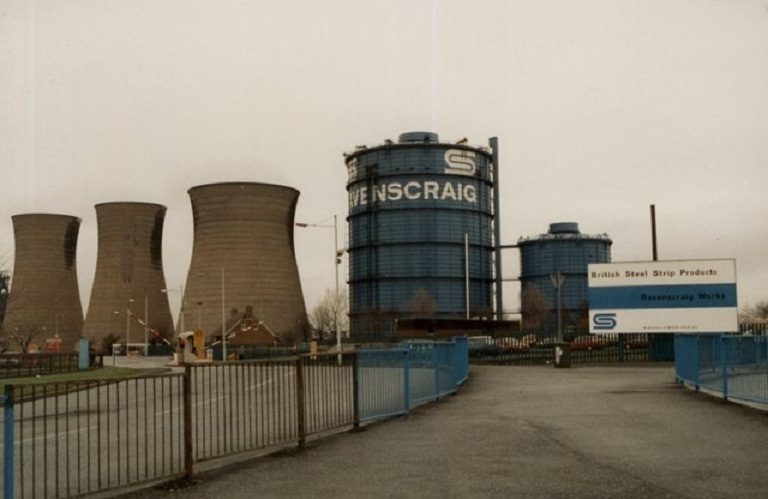 In 1954 it began work on an expansion which would become Ravenscraig, later nationalised in 1967. The steel industry in the town employed more than 13,000 people by the mid 1970s. David Gibson, Glasgow’s Housing Convenor from 1960 until his death in 1964, was an enthusiastic proponent of building high in order to clear the slums. His views were influential throughout Scotland and soon housing convenors in many large Scottish towns wanted to follow his example. Glendinning and Muthesius describe Sneddon as ‘the most dynamic’ of Gibson’s allies. He ‘pushed through’ a house-by-house survey of the entire burgh, which justified his redevelopment of land to the south of the town centre. 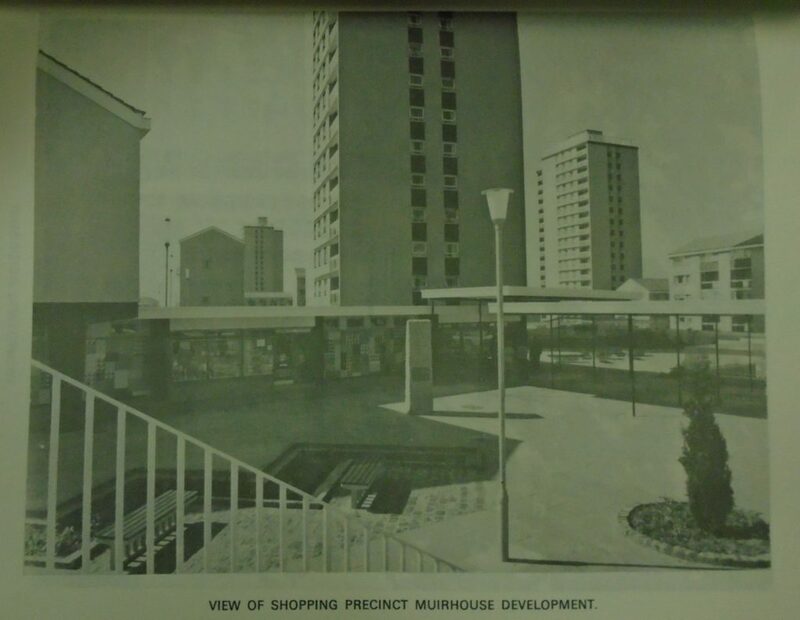 Here he employed Wimpey to build Muirhouse, a 1,344 dwelling scheme including seven 18-storey high rise blocks, completed between 1963-4. These blocks were to be used for ‘decanting’ so that the council ‘could pull people out from the tenements and immediately demolish and rebuild on site!’ (Glendinning and Muthesius, Towerblock, 1994, p. 236). Firstly, a high standard of supervision – a caretaker’s office in every block. Secondly, no young children in blocks and no flats bigger than three apartments (two bedrooms). Thirdly, a high standard of finish. We spent a bob or two on finish, and it was successful – people polish their floors in Motherwell blocks! Whereas Glasgow would spend their money on the highest specification lifts, electrics, plumbing, things you couldn’t see, then just leave the blocks to the vandals! Sneddon also assigned his deputy, J. Dickson, with the task of defending their high rise in a report entitled ‘High Living’, published in January 1970, which was a study of resident’s views. 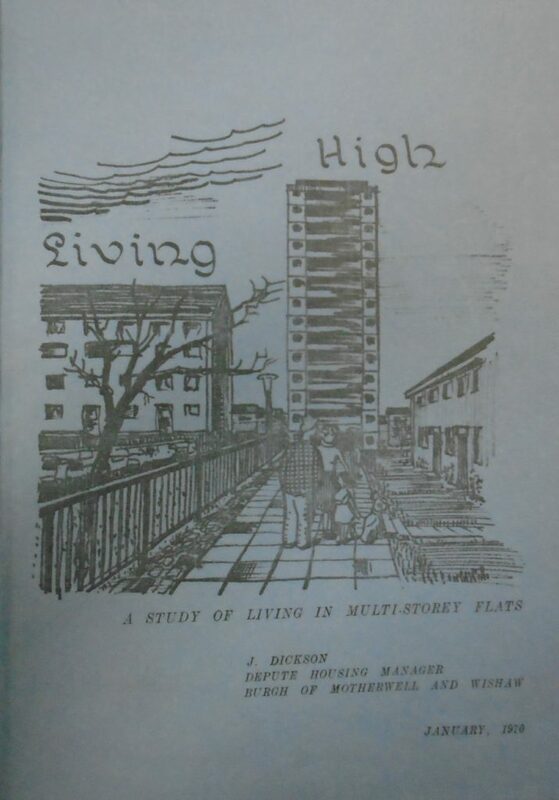 Here Dickson explains the ‘controversy’ surrounding multi-storey developments with blocks being described as ‘concrete castles’, ‘Match Box Dwellings’ and ‘Slums of the Future’ with it being suggested that living high is ‘unnatural, lonely and impersonal’. His report was ‘an attempt to provide sound information by analysis of tenant’s requirements to living high in Multi-storey flats within the Scottish pattern of society’. 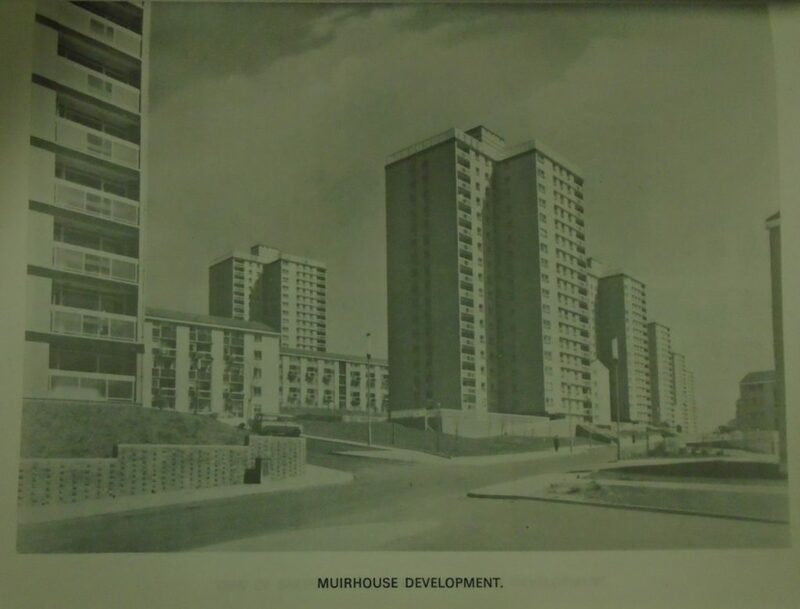 (J. Dickson, High Living: A Study of Living in Multistorey Flats, Motherwell, 1970). What did Dickson find in his survey? Well the picture presented was largely positive: ‘the majority of the tenants appear to be perfectly satisfied with the standard of the house provided’ and ‘some comments have been made by tenants that the only regret was that this accommodation had not been available sooner’. There were some ‘minor’ criticisms such as the houses being draughty and complaints about the ‘lack of soundproofing’. In relation to the block, there were some complaints relating to the lift though these were dismissed as ‘teething troubles’ and it was suggested that children had ‘discontinued their mis-use of the lifts’. In addition the services provided on the ground floor, including laundrettes, telephones and common rooms, were ‘most acceptable to the large majority of tenants’ and it was found that ‘there appears to be a communal understanding between the tenants’. Dickson suggests that given the number of tenants you may have expected the opposite, but in fact ‘there have been very few incidents of quarreling in comparison with low-rise developments’. Finally general comments indicated that there was ‘a great deal of satisfaction’ with ‘the scheme’ though there were some comments about the insufficient play areas especially for teenagers who made a lot of noise playing football. So in the late 1960s, there appeared to be ‘little complaint’ and it was ‘evident that the tenants are cooperating and settling down to living in high density areas’. Recently we posted some of the responses to our online questionnaire on the project website. However we didn’t have space to post them all, including Sharon’s memories of her time living in a high flat in Motherwell (with thanks to Sharon for giving permission for her questionnaire response being posted here). From parents house in Netherton, Wishaw. Had got married and it felt good getting our own place. Obviously not what I ideally wanted but I was young and it felt good at the time. It was a two bedroom flat, decent size rooms, narrow hallway, L shaped. The bathroom had no window which I hated and previous tenants had artexed the walls in there which I also hated, it got a bit damp and looked horrible. We were low in cash at the time so the decor was not great but we made it our own. Kitchen was narrow and I hated the cupboard with the pipes in it. Typical council flat. View was great though, we were on the 16th floor of a 17th floor tower! My eldest was a baby when we moved in. We split two years later so then I was a single parent. It was hard living on my own. I spent a lot of time through the week in the flat as all my friends/family worked and didn’t have kids. I would go out to local parks to get out and about. I met my middle daughters dad when eldest was 4yrs old, and a year later he moved in, and we got the place all decorated and looking lovely. We liked the flat but I still hated not having a garden especially in summer. Winter was cozy, in windy weather the tower moved which was freaky! I was always scared the kids would open the windows and fall out too! You had your washing time slot in the laundry and I didn’t like having to go up and down all the time and it didn’t always suit either. The people in the tower were mostly old and nice but there were a few folk I didn’t like. I mostly kept to myself and only spoke to a select few. When eldest was out playing I hated that I couldn’t keep an eye on her, it wasnt ideal. One time a wee boy was hitting her and I had to run down to bring her up, would have been easier and quicker in a house!! My family were only 10mins away and my mum always visited, babysat the kids at weekends and was there when I needed them. I had lots of friends too and so never felt isolated or anything, We went to my parents for dinner every Sunday for years, then every second Sunday. My partners mum stayed in flats below us and his brothers & sister were not too far away and visited us too. When I first moved in I didn’t really speak to many people in the tower or area. But over time you would say hello or chat to people in the lift it laundry. The caretaker was a nice guy. My neighbours were a little old lady who was nice and an old man who’s house was stinking! When they both died (at different times) the new neighbours were awful! This seemed to be when things changed, older people moved out or died and younger folk moved in. In addition, there was a murder while we were in holiday and a lot of folk moved out after that. It had been generally a very good tower and safe with nice people until after that and it slowly went down hill. I spent a long time living there, it was an experience, and was good for a few years but I wanted a house with a garden, which I got in 2003 and I would never live in a tower now.